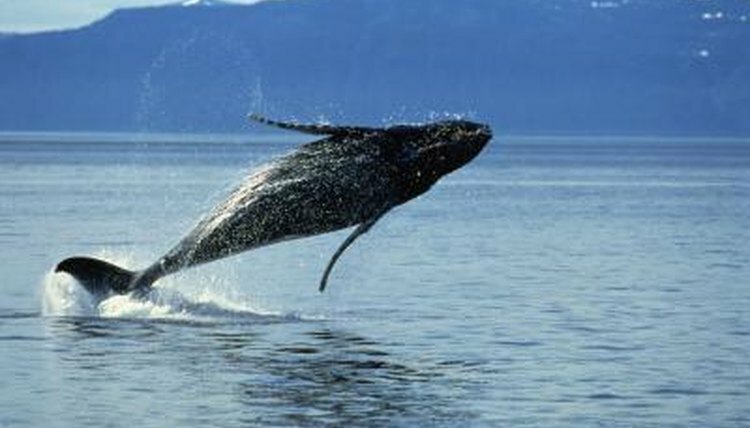 Humpback whales live in all of the Earth’s oceans, often migrating thousands of miles seasonally. Their distinctive behaviors include breaching -- catapulting their whole bodies out of the water -- and slapping the surface with their tails. They eat plankton, small crustaceans called krill, and fish such as herring and mackerel; adults may devour 3,000 pounds daily. During the summer, most humpback whales swim toward the North or South Poles, where they find abundant food in temperate and cold waters. In the winter, they migrate to tropical or subtropical areas to mate and calve. Many whales travel 3,000 miles each way. Scientists tracked one pod that migrated more than 5,000 miles. Only humpback whales living in the Arabian Sea don’t migrate, although scientists aren’t sure why. Humpback whales court, breed and calve in warm seas, often close to the shore. Males compete for female attention by thrashing their tails, chasing other males, blowing bubbles and engaging in other posturing displays. They sometimes even clash physically. Scientists think breaching might be part of courtship. Male humpback whales sing, often repeating the same 10- to 20-minute melody for hours. Within a population, all males share a song, but it changes from year to year. When a male and female decide to mate, they swim together, breach, dive, roll and engage in other activities that resemble play. Eleven to 12 months later, after migrating for the summer and then returning to warm waters, females give birth. Newborns measure 10 to 16 feet and weigh as much as a ton. They remain with their mothers for a year and nurse for five to 12 months. Female humpbacks seem affectionate and protective toward their calves, and other adults often travel with the mother and baby. Most females give birth every other year. Most humpback whales become sexually mature when they’re between 6 and 10 years old, depending on their size. Males generally must be at least 35 feet long and females 40 feet before they can reproduce. Fully grown males usually reach 40 to 48 feet; females average 45 to 50 feet but can measure up to 60. Adults usually weigh between 25 and 40 tons. Scientists don’t know the length of a wild humpback's life span; estimates range from 30 to 95 years. Since 1966, these whales have been protected from most hunting under the International Whaling Commission, but they still face plenty of threats. In addition to poaching, they’re frequently caught in fishing nets, and collisions with ships also result in fatalities. Whale-watching tours may harass or stress the whales who often put on a show right off the boat's bow. The US National Oceanic and Atmospheric Association is working with international partners to develop and enforce protections for these magnificent animals.